Various sources report that the iPhone App Store will launch today. It’s clear that iTunes 7.7 is out, featuring the ability to control iTunes from a new free iPhone/iPod Touch app, and the New York Times says that Apple will be launching the app store. Fortunately, I’m still getting mail on my iPhone. 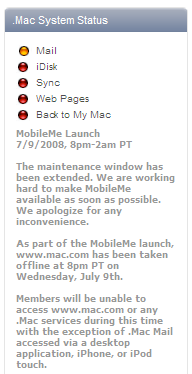 But maybe this means a MobileMe launch is imminent too. 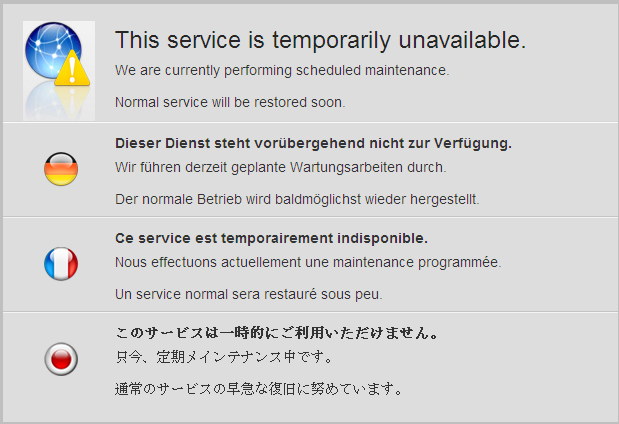 Update 2: As of noon-ish on the east coast, the update now says that all services are back online except for webmail and web pages: “With the exception of the new web apps, all of the following services are available: Mail, iChat, iDisk, Sync, Back to My Mac, and all published pages, including Galleries and iWeb sites.” Smart money has it that there’s a contingency plan being executed while they figure out why the new MobileMe apps aren’t RTWing successfully.